Understanding Buffer Overflows Attacks (Part 1) | IT & Security Stuffs!!! I am very excited about this topic, because I think that the process of exploiting a buffer overflow vulnerability is very creative and a bit difficult to understand because all the different knowledge required to pull out this type of attack. I want to approach this by splitting the post in two parts. In the first part I am going to review how the CPU and Memory of computers works and how the buffer overflow works, the problems to exploit it and how resolve those problems. I am leaving for the second part a more practical post where we are going to exploit a simple application to illustrate how a buffer overflow attack is performed, it will involve a little bit of programming in Pyhton, and a little bit of playing with the Immunity debugger. Now that we have a clear how this post will be divided, lets begin with the first part. How the Memory is organized? The memory model for an X86 Processor is segmented and organized from higher address to the lower address, like you could see on the figure. We are not going to enter in details of which are the purpose of each segment, it is suffice to know that the instructions of the program are at the lower end of the memory and the stack is at the higher end of the memory, in the next sections we will talk about the stack and why is important. The second thing that we are going to review are the registers,why are used and what they are used for. 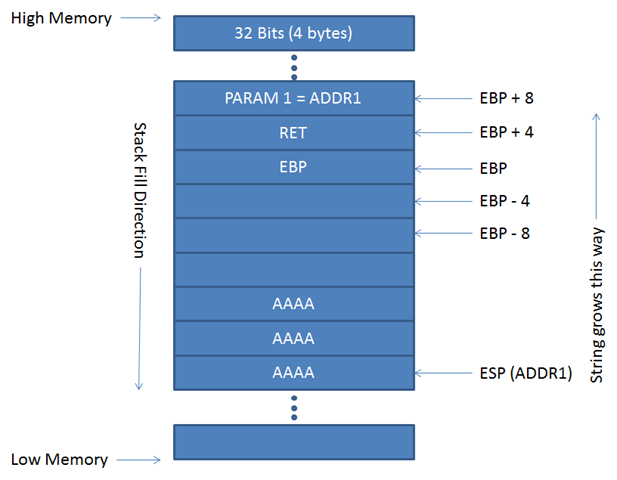 It is important to understand that each Processor Architecture is different and we will find that the registers on x86 processors are different than maybe the Motorola 6800 Processors, 8080 processors, etc… even between x86 processors we will find differences about the size of the register and that is why we have 16, 32 and 64 bit registers depending the type of architecture that you have. 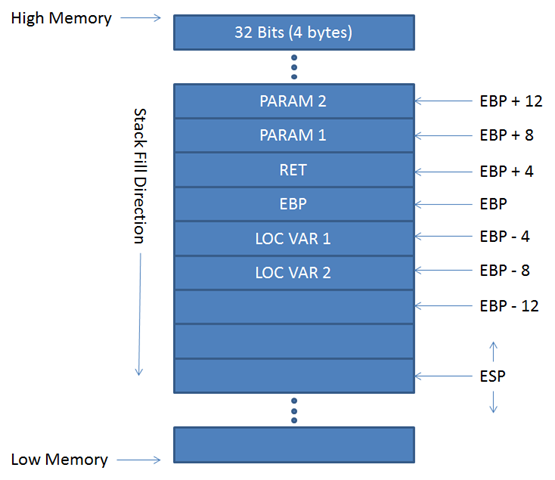 EBP is the Extended Base Stack Pointer and its purpose is to point to the base address of the stack. EIP is the Extended Instruction Pointer it is a read-only register and it contains the address of the next instruction to read on the program, point always to the “Program Code” memory segment. 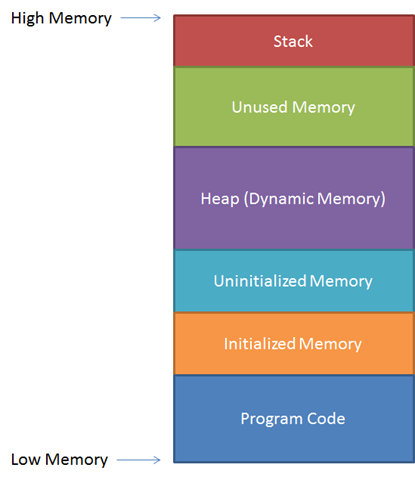 The stack is very important in the assembly language, the stack is a part of the memory configured as a LIFO (Last Input First Output) data structure, used as a temporary storage area to quickly access data used for the assembly program, the stack could be defined in different positions any time, and that is why the EBP register is used, to point to the base address of the stack, it is important to mention that the stack grows from high memory address to low memory address and grows each each time that we “push” some data in the stack and shrinks each time that we “pop” something from the stack, the top boundary it is always pointed by the ESP, which is always changing his value. Why EBP is so important? EBP is important because it provides an anchor point in memory and we could have a lot of things referenced to that value, when we call a function inside a program and we have some parameters to send to it, the positions in memory are always referenced by EBP as well as the local variables as you could see on the figure. Now that we “know” a little bit about how some things works inside the CPU and memory of a computer when run a code, we can now understand what is a buffer overflow. Analyzing a little bit the figure we see that PARAM1 point to the address where the data is saved in the stack, and as we know ESP points to the top to the stack so the string is copied from ADDR1 4 bytes at a time to Higher memory, and this happens because is the only way to remain inside the stack. If it happens that the EIP register is overwrite by the A’s, then you altered the address to return for the execution of the next instruction, obviously if the EIP is overwrite with “noise” you will have an exception raised and the program will stop. As I said in the previous section if EIP is overwritten by “noise” the program will stop with an error, but what happens if the string sent is crafted so the EIP is overwritten with an address that “makes sense”? and what happens if the address that “makes sense” results to be the beginning of a code that do something? If that happens the you exploited successfully the buffer overflow. You don’t really know where the EIP is located, without the address of the EIP register then you could not craft the string to overwrite the address with an address of your choose. The third problem is that each function has some hexadecimal values that could not be used, this hexadecimal values translate to a character that could cause a problem and stop the execution of the function, examples are: 0x0a (Line Feed LF), 0x0d (Carriage Return CR), etc… So what happens is that if the address of ESP contains one of this characters then the exploit will not be successful. The First problem is resolved easily, all that you have to do is send a unique pattern of characters as a string to provocate the buffer overflow, once the string is sent, EIP will be overwritten by a unique 4-bytes pattern that could be searched in the original string to find the offset position in the string, then you could replace this part of the string with the ESP address, you should also add the payload that will be used to exploit successfully the buffer overflow. This problem could be resolved in two ways, the first one is using any Disassembler/Debugger (Ollydbg, IDAPro, Immunity, etc…) and manually attach to the process and analyze the registers at the moment of the exception, another way to do this is using a programming language like python to write a pycommand for Immunity (this solution always involve the use of a debugger, Immunity in this case) or you could use pydbg (a python debugger library) to analyze the exception and print the register values. As I explain previously there are some characters that force the function to stop working when passed as parameters. Find out which characters are considered bad characters in a function is an easy but tedious process, the main idea behind it is to send a string formed by all the characters in Hex (from 0x00 to 0xFF) and monitor manually with a Disassembler/Debugger or programmatically using pycommands for Immunity or pydbg for python. When a bad character is sent the string sent is truncated just before the bad character revealing one of the bad characters, then you need to repeat this process eliminating each bad character found, until all the string is passed. In assembly there is a mnemonic (command) called JMP, what it does is to “jump” to the address specified after the command, so JMP ESP will jump to the address specified in the ESP register, now we only have to find a memory address without any bad character inside the area where the code is loaded that have this instruction and use it as the EIP address, you could do this with a pycommand or using pydbg. Ok, we know abut Memory, Registers, Stack, what is a buffer overflow and the theory about how to exploit it, this is a very useful information, but… How do I know that an application has a buffer overflow vulnerability? There is no an exact procedure on how to know if an application is or isn’t vulnerable, normally you could disassembly the executable, and see if there are calls to functions in dll’s that are known to be prone to this vulnerability, for example calls to functions like strcpy, gets, scanf, and others, if this functions are present there is a good chance that the programmer did not have some type of boundary check and that mistake could lead to a vulnerability. With that we finished the first part of this post, at this point do you have a basic understanding about a Buffer Overflow vulnerability, how exploit it and which problems you could find along the way, on the second post we are going to put in practice this theory in an example of exploitation so the second part could be found following this link.